Former U.N. ambassador John Bolton took over as Trump’s National Security advisor on April 9th. Richard Painter, the former chief White House ethics lawyer in the George W. Bush administration, blasted the prospect of former US Ambassador to the UN John Bolton replacing General H. R. McMaster as President Donald Trump’s national security adviser — a prospect that came to fruition Thursday. Bolton is another hawk who shows no evidence of having learned from past mistakes; and he’d be put in a position to urge many new wars—he has favored many more wars in his lifetime than America has fought, including all the most ill-considered wars that it has actually fought. What’s more, the risks that a hawk prone to supporting ill-considered wars would pose to any administration are likely to be magnified under the erratic, bellicose Trump, especially if he seeks to compensate for his fragile ego or insecure masculinity, or simply decides he wants to be an even greater object of attention. Bolton has also been very hawkish on Iran, writing an article for the National Review titled “How to Get Out of the Iran Nuclear Deal.” The article was, according to Bolton, originally a gameplan for Trump that Bolton had drawn up and given to former White House Chief Strategist Steve Bannon. When the Trump administration debated how hard to bomb Syria, John Bolton, the president’s hawkish new national security adviser, suffered a surprising defeat. This may seem like a strange thing to say, given that Trump did just bomb three Syrian government regime installations. But it’s not: Bolton was advocating a far more expansive intervention, one designed to do “ruinous” damage to the Assad regime’s military capabilities (per the Wall Street Journal). The former United Nations (U.N.) ambassador and undersecretary of State for arms control has faced accusations of politicizing intelligence during the run-up to the Iraq War and seeking retributive firings of analysts whose findings he disagreed with. Carl Ford, who formerly headed the State Department’s intelligence unit, gave dramatic testimony opposing Bolton’s nomination to the U.N. post in 2005, called him a “serial abuser” of subordinates and warning that of “great danger” that Bolton would manipulate intelligence. The Senate blocked Bolton’s confirmation for months and he ultimately got the job through a recess appointment by Bush. 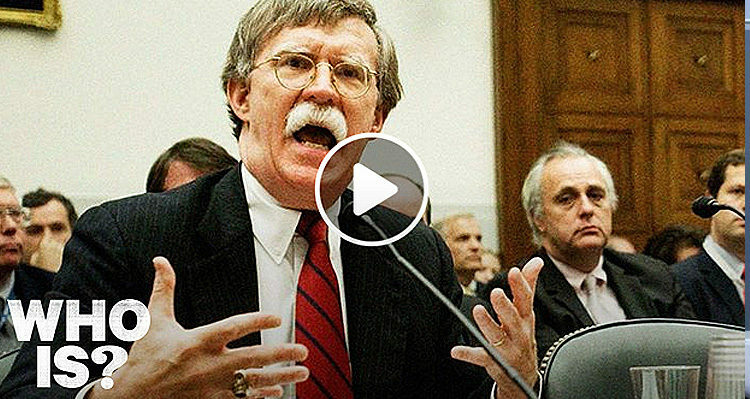 There is a lot more to the Bolton story and, fortunately, Now This News released a comprehensive video last Thursday detailing his background. Watch the clip below, and let us know your thoughts in the comments section.